When it comes to making your house safe for a curious (and quick!) baby or toddler, anxious new parents may not even know where to begin. Here are 11 easy tips to get you started. 1. WORK YOUR WAY FROM THE OBVIOUS TO THE NOT-SO-OBVIOUS. In general, it’s wise to start with anything that sticks out as a potential danger zone—padding sharp corners, gating staircases, and covering power outlets—and then take everything else as it comes. 2. TURN A TOILET PAPER TUBE—REALLY!—INTO AN IMPORTANT TOOL. Keep a toilet paper tube handy to test if a toy is a choking hazard. If the item can fit completely in the tube, or be pushed through, that means it’s small enough to fit into a young child’s mouth, nose, or ear. 3. SKIP THE FANCY CABINET LOCKS. Many traditional cabinet locks have to be installed and mounted, complete with drilled holes, and they’re often more trouble than they’re worth— those plastic latches often trip up just as many adults as kids. Keep it simple when securing side-by-side kitchen or bathroom cabinet doors with rubber-coated wire gear ties, available at any hardware store, or even elastic hair bands. 4. GET ON YOUR CHILD’S LEVEL. 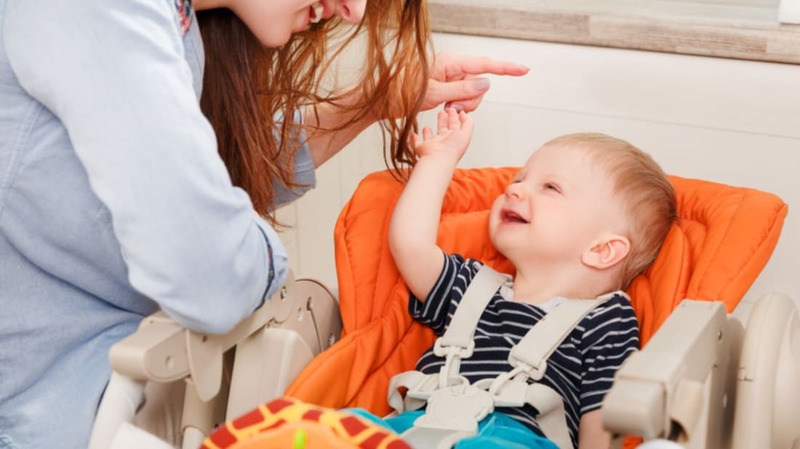 To better understand what could grab the attention of an eight-month-old crawler or a teetering two-year-old, spend a few minutes at their eye level. Crouch down on the floor and make your way around the house, noting what’s in arm’s reach. If you can easily grab breakable items on low bookshelves, move them to higher ground. 5. VISITING FAMILY? BREAK OUT THE BANDAGES. Plastic outlet covers are cheap, but in a pinch (or when your family is staying at someone else’s house for the weekend), you can DIY your own using adhesive bandages or strips of electrical tape. 6. KEEP A DRAWER OR TWO KID-FRIENDLY. When you’re trying to cook a meal, constantly having to corral a toddler away from the kitchen can be distracting. Consider having one bottom-level drawer that’s kid-friendly. It should be easy to open and contain bowls, pots, and wooden spoons you don’t mind getting clanged about. The perk? Knowing this drawer is accessible to them makes it less likely they’ll go snooping in others. 7. HELP YOUR TOT GET A GRIP. As your little one learns to walk, turn slippery socks into ones with soles that grip the floor. Draw zig-zags on the bottom of each pair with either fabric glue or puffy paint to get the right effect. 8. CONSIDER YOUR LIVING ROOM’S LAYOUT. Even furniture can pose a threat to precocious kids. Wall-mount pieces that they might be prone to climb, as even pieces less than three feet tall can topple. And be aware of where you place furniture, as it’s safest to avoid putting chairs against the wall beneath windows. 9. TURN A LAUNDRY BASKET INTO A BATHTIME NECESSITY. Make bath time less stressful by placing your baby in a laundry basket inside the tub. The makeshift bath seat keeps their toys from floating out of reach, which can lead to slipping. Plus, it makes cleanup a cinch. 10. DON’T FORGET THE “OFF” DIAL. Cleaning supplies and other household products— from laundry detergent and dish soap to seemingly-innocent baby shampoo— should be safely secured out of reach. Not only that, but when available, take advantage of the “off” dial setting on the bottle’s nozzle just in case one gets into the wrong hands. 11. TEACH THEM HOW TO HANDLE POTENTIAL HAZARDS. It’s easy to spend a fortune child-proofing every possible hazard in one’s home, but remember: if it can’t hurt them, teach them. Whenever it’s possible to teach your child how to handle a certain object or scenario safely, opt to do that. Letting them learn boundaries—with you watching, of course—can make the transition away from babyproofing easier in the long run.